The Pentathlon (consisting of running the length of the stadium, jumping, throwing the spear, throwing the discus and wrestling) was introduced for the first time at the 18th Olympiad in 708 BC and held a position of unique importance in the Games. It was considered to be the climax, with the winner ranked as “Victor Ludorum”. Modern Pentathlon was introduced at the 5th Olympiad in Stockholm (SWE) 1912, comprising the contemporary sports of pistol shooting, fencing, swimming, horse riding and running, which embraced the spirit of its ancient counterpart. This new sport was enthusiastically adopted with its inherent demands of courage, co-ordination, physical fitness, self-discipline and flexibility in ever changing circumstances. A young American Lieutenant, later to be the famous World War II General, George S. Patton, was to finish fifth in the first ever Olympic Modern Pentathlon competition. The mixture of physical and mental skills demanded in the Pentathlon has also meant that athletes have been able to compete in as many as three or four Olympic Games. This is because while running and swimming times can be expected to decline with age, experience and skill in the technical disciplines often increase. The oldest Olympic gold medallist (in the team event) in the Modern Pentathlon to date is Pavel Lednev (former USSR) who was 37 years old at the 1980 Games in Moscow. In the same Olympic Games the individual gold medallist (former USSR) Anatoly Starostin was 20. Today, both men and women compete in all five events of the Modern Pentathlon in one day, and for major upcoming events such as the Tokyo 2020 Olympic Games, every discipline will be held in one stadium allowing a complete spectator experience. A points system for each event is based on a standard performance earning 1000 points. 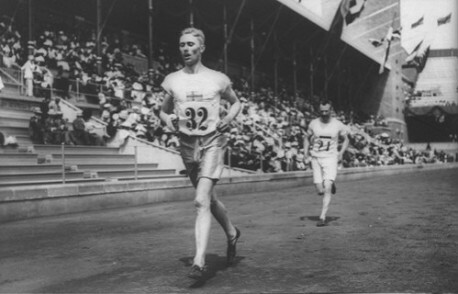 The starting order of the last event is dictated by time handicaps, meaning that the winner of the competition is the first athlete to cross the finishing line. The Combined Event, running and shooting as one, was introduced as the climax in 2009 and laser shooting was rolled out as a replacement for air pistol shooting over the following two years. The UIPM now organizes an annual World Championship for senior, junior and youth athletes, as well as a World Cup Series that consists of four events culminating in a World Cup Final. Apart from the one-stadium concept, other innovations include a Fencing Bonus Round, and Modern Pentathlon as an audience spectacle is now very different to what it was in Coubertin’s day. The principles, values and the nature of the sporting challenge, however, remain unchanged. Modern Pentathlon becomes an Olympic sport at the 5th Olympiad in Stockholm (SWE) and the five sports are spread across five days, a format that continues until 1996 with the exception of three Games (1920, 1984 and 1992) where a four-day format is used. Sweden are the dominant force in the early years, until Hungary becomes strong in the 1960s and then it becomes gradually more open worldwide. Charles Leonard (USA) becomes the first Modern Pentathlete at the Olympic Games to achieve a perfect shooting score of 200. The UIPM is founded by Sven Thofelt (SWE) who serves as President until 1971. In the same year the inaugural UIPM World Championships are held, with Stockholm again the historic first venue. A new scoring system is introduced, whereby a points total is allocated to each performance and the overall scores are aggregated to determine finishing positions. For the first time at the UIPM World Championships, women are admitted, albeit only on a trial basis. The first UIPM Women’s World Championships duly takes place in London, separate from the men’s event which takes place in Poland. The Olympic Modern Pentathlon is compressed into four days, with shooting scheduled to take place five hours before the final running event. Also, starting positions in the run are decided by handicap according to performances in the first four events. For the first time, the first competitor across the finish line is the champion. The Men’s World Championships introduces a relay event, adopted two years at the Women’s World Championships. The Barcelona Olympics changes the format to end with the equestrian event, an order not seen at the Games since 1928. The result is dramatic, with Russia’s Eduard Zenovka (RUS) losing his lead to Arkadiusz Skrzypaszek (POL) after falling twice, but the experiment is not repeated at subsequent Olympic Games. Dr h.c. Klaus Schormann (GER) becomes UIPM President, a position he holds to this day. Shooting undergoes a major change at the UIPM World Championships in Sheffield (GBR), where the weapons change and 25m moving targets are replaced by 10m stationary targets. The one-day format is introduced at the Olympic Games in Atlanta (USA) and proves very successful. The team event is discontinued. Sixteen years after its introduction, the UIPM Women’s World Championships ceases to exist and men and women join forces to create a single World Championships. The Olympic Games catches up with the inclusion of women in Sydney (AUS) to great acclaim. The freestyle swimming event is fixed at 200 metres, and the running distance is switched from 4000 to 3000m. The Combined Event of shooting and running is introduced, and there is another change to the shooting format in that competitors now run three 1000m laps, each prefaced by hitting five targets. Laser pistol shooting is piloted at the 1st Youth Olympic Games in Singapore and the Mixed Relay is added to the UIPM World Championships. The UIPM World Cup becomes the first senior international competition to embrace laser pistols, and once again the improvement is well received. UIPM proposes a revolutionary new concept for the sport which would see all five events staged in the same stadium. On February 11, in Lausanne, the IOC announces that Modern Pentathlon has retained its place as one of the 25 core sports of the Olympic programme until 2020. The Combined Event adopts a new format of 4 x 800m laps, each prefaced by laser shooting at five targets within a maximum time of 50 seconds. The Fencing Bonus Round is approved at UIPM Congress and scheduled for introduction in 2015. The new format offers all athletes the chance to win bonus points to top up their score, and all the action takes place on a showpiece piste. UIPM joins the International Paralympic family and the University sports family by becoming affiliated to the IPC and FISU respectively. The first UIPM Laser-Run World Championships are held in Perpignan (FRA). The simple new concept of run/shoot as a standalone sport allows cities to host UIPM events as well as rural and stadium venues, and it offers a new route into the sport for athletes from developing nations worldwide.